Sophisticated Cold War Armored Combat On Your Kitchen Table. For those new to Metal, Magic and Lore, click here for the Free Game System Sampler. It includes two scenarios designed to introduce MML’s unique, gritty, and detailed combat system: one-on-one melee combat, and ranged combatant vs. a magician. For established players, the Rules Errata Booklet is available for the original version of the core rules. Also, get a glimpse into the future of MML; keep an eye out in the coming weeks for a series of MML Update Mods; new Character Creation, new role-playing mechanics features, a world atlas setting, and a magic supplement. Lots of additions to the Metal, Magic, and Lore Universe are coming in first quarter of 2019! Several FREE downloadable PDFs which provide updates to your current game are in development, including a Revised Character Creation Mod, and GM’s Role Playing Playbook Mod. These will be followed later in the year by a GM’s World Atlas Mod which will include some excellent bonus setting materials on geography, politics, languages, and interactions of the races, and the Genealogy of Magic Mod, with an in-depth illustration of the magic schools, their origins, new and lost spells, and a number of potent magical items. The Eastern Kingdoms Atlas is the first in a series of four supplements dedicated to exploring the politics, economy, myth and history of each region, including lush, detailed maps. The Eastern Kingdoms Atlas also includes rules for a new magic school, Thaumaturgics, as well as a number of magical items and beasts local to the East. This product features artwork by Brent C. Chumley, Amanda Kahl and Jack Parra. Future releases will include the Middle Kingdoms Atlas, Western Kingdoms Atlas, and Northern Kingdoms Atlas. Box Battles players had some new releases headed into winter 2018; several new BattleMatch™ and AlterForce™ expansion sets for more play options at the table. Due to demand from 6mm modern war miniatures collectors, 2019 brings a series of new offerings to our Products page! The Box Battles: Cold War Evolution Rulebook is available in PDF and print. The FREE BattleField Ops! System Rules Update 1.1 is also available, along with a wide variety of combat Units Cards sold individually. Late Spring 2019 you will see our FREE Air-to-Ground Rule Update, along with related air and anti-air Unit Cards sold individually. We are continuing to develop rules and unit expansions for World War II-era conflicts and materiel! If you have expert knowledge in this field, we’d love to benefit from your insight and expertise. Contact us at info@5thepochpublishing.com if you’d like to participate in the evolution of Box Battles! Lots of Vampire’s Codex excitement coming! The Vampire’s Codex Game Master’s Screens will be a handy (and attractive!) playing aid for both the GM and player alike (New Year 2019). Our next Adventure Starter, The Sifuridin Strain (working title), is being developed by Ben Walker. This adventure adds deeper elements of commerce and espionage to the play experience of TVC. It will be flexible and scalable to multiple styles and difficulty levels for the GM’s use. The first Vampire’s Codex novel by J.A. Dohm is in editorial. This collection of interwoven stories of the Vampire’s Codex world will introduce readers new to the setting a new and unprecedented world of modern horror. For those who are already TVC players, it is sure to add rich backstory to your campaigns. 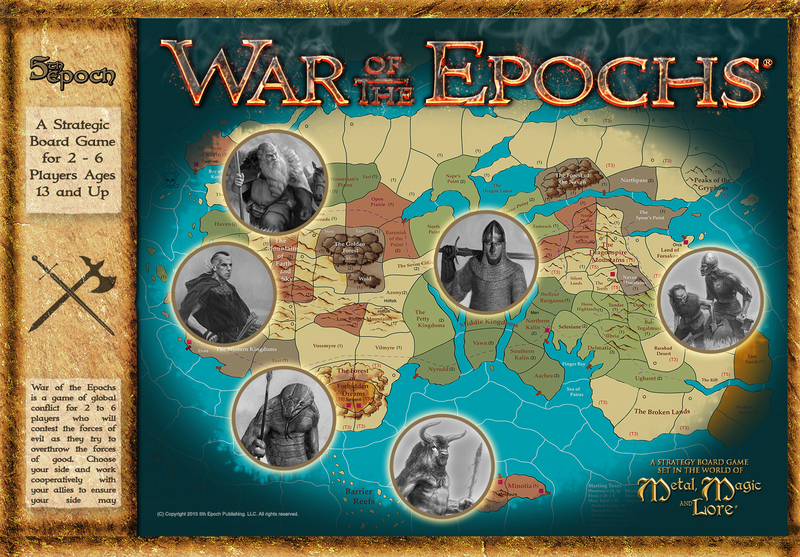 We’re thrilled by the great response that War of the Epochs, the strategy board game of epic warfare in the Metal, Magic, and Lore universe, has received this year at cons, playtests, and demos! Production and testing has continued and we’re currently working on bringing the art and visuals to the standards of our magnificent playerbase. Presently, production for rollout is now expected late 2019. Check back with us later for more updates! Lots of additions to the Metal, Magic, and Lore Universe are coming late 2017 and beyond! The Deeping Vale Adventure Starter is in final production. This new edition will contain new content beyond the previously-released PDF! The rerelease of the first MML novelization, Azony Rising (formerly Lines of Bread and Steel) by R.K. Pynn will be available this holiday season. R.K. Pynn is currently working on the sequel to this novel, in which we will learn the fates of Azony and our two heroines. Future releases will include the Middle Kingdoms Atlas (Summer 2018), Western Kingdoms Atlas (Winter 2018), and Northern Kingdoms Atlas (Spring 2019). Modern Action and Espionage with The Vampire’s Codex system – No Fangs Necessary! The Vampire’s Codex introduces rules for firearms, body armor, 8 distinct styles of hand-to-hand combat and vehicle data for high speed auto or boat chases or flying small aircraft. All this can provide a great start to a world of covert adventure! While you await the release of the compatible Ultimate Operative game next year, The Vampire’s Codex rules system will give GMs designing a realistic modern campaign setting of their own all they’ll need- with or without wooden stakes. Lots of Vampire’s Codex excitement coming very soon in early 2018! The Vampire’s Codex Game Master’s Screens will be a handy (and attractive!) playing aid for both the GM and player alike. The first Vampire’s Codex novel by J.A. Dohm is coming soon. This collection of interwoven stories of the Vampire’s Codex world will introduce readers new to the setting a new and unprecedented world of modern horror. For those who are already TVC players, it is sure to add rich backstory to your campaigns.